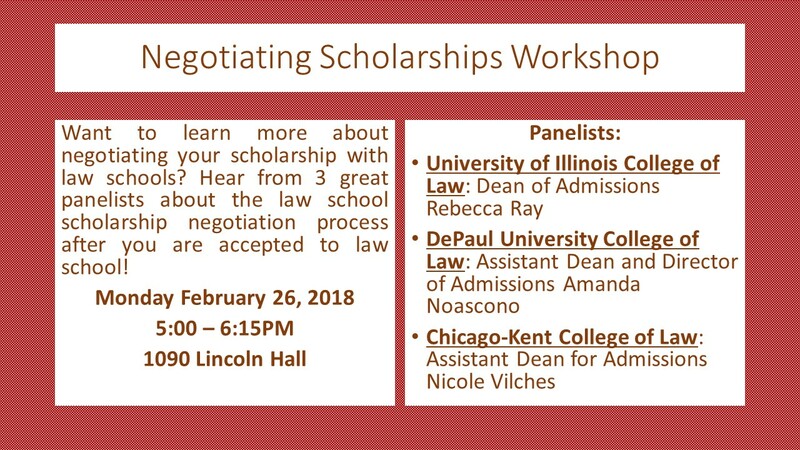 Our next event will be the “Negotiating Scholarships Workshop” on Monday February 26! The event will be held at 1090 Lincoln Hall from 5PM – 6:15PM. A preview of our March event . 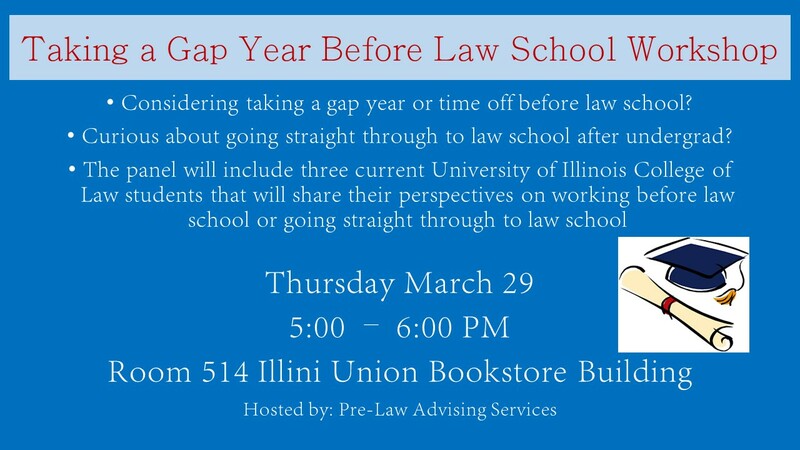 . . “Taking a Gap Year Before Law School” will be on Thursday March 29th in Room 514 of the Illini Union Bookstore from 5:00 – 6:00PM. The Women’s Career Institute will be Saturday, Feb. 24 from 9-5 pm. This daylong workshop includes sessions on job search strategies, authenticity in the workplace, salary negotiation, and more, along with networking opportunities. For more details and to register visit their website here. 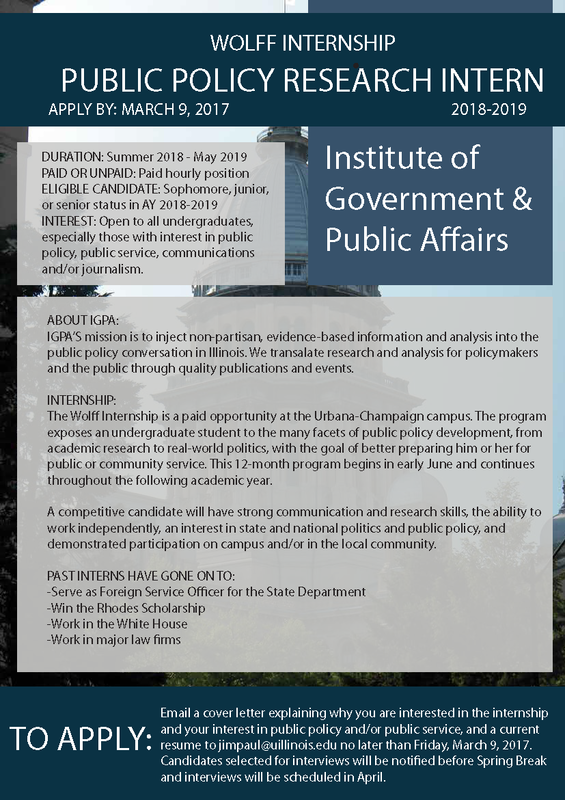 The Institute of Government and Public Affairs is hiring a PAID summer and academic year undergraduate public policy research intern! Applications due March 9. Upcoming Law School Opportunities–open to pre-law students! The Wisconsin Statewide Pre-Law Diversity Day will be Friday, Feb. 23 at Marquette University Law School in Milwaukee. 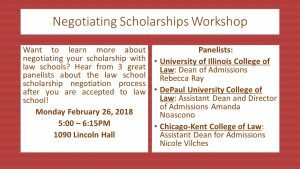 This free event features sessions with the deans of both Marquette and University of Wisconsin law schools, a law school admissions update, mock law school class, tours, lunch, and a mini law school fair. For more details and to register visit their website here. Chicago-Kent PLUS program. Applications due March 1. Indiana ICLEO Summer Institute. Applications due March 1. Taking the LSAT “Cold” – Good Idea or Bad Idea? Some students believe that they should take the LSAT “cold” or without preparing for the exam, because students can take the LSAT multiple times. So is it a good idea to take an actual LSAT (not a practice one) without prepping just to get the experience? You should take the LSAT seriously. The LSAT is a crucial element of your law school application. Your LSAT and your GPA are two of the most important parts of your application. Take this part seriously. A good LSAT score can increase your odds at getting into a school with a higher ranking, a school in your preferred location, more scholarship money, and give you better options when you make your final decision. Every LSAT score is sent to the schools you apply to. Even though you can take the LSAT multiple times, every score is sent to every law school to which you apply. You cannot hide a low LSAT score from any law school. Most schools want for you to explain if your score increases by more than 5 points. Most people that take the LSAT cold and then seriously study for the exam oftentimes have to explain large score increases or discrepancies. It is difficult to do so without indicating that you were unprepared for the exam. A “cold” LSAT score can show that you were not prepared. If you have two or three extremely different LSAT scores because you took the LSAT cold, it will show that you were not prepared for the tests. Law schools may read into the fact you took an LSAT cold – you may come across as an unprepared or unorganized applicant. Schools may average your LSAT scores. Because you can now take the LSAT as many times as you want, law schools may use different systems when looking at multiple LSAT scores. It is possible schools may average your scores, look to the middle test score, or consider your multiple LSAT scores in a different way than you may have planned for. Our best advice for LSAT prep: allow yourself about 4-6 months to prepare for the LSAT; prepare a realistic study plan, stick to the plan to study consistently, and be honest with yourself and your studying. The LSAT is NOT the same as the ACT or SAT because the LSAT tests your critical thinking rather than your knowledge of any particular subject. Your SAT or ACT score is not necessarily a good predictor of your LSAT score for this reason. The LSAT does NOT test the same material as the ACT, SAT, GRE, or GMAT. The topics and approach to the LSAT should be unique to the LSAT. To prepare properly for the LSAT, as a general rule four to six months of consistent studying is encouraged. The LSAT is not a test that comes easily to many students. It is important to give yourself enough time to study and feel prepared for the test. The next LSAT is Monday June 11, 2018. For more information about the upcoming LSAT, click here. The registration deadline is Tuesday May 1, 2018. If you are planning on taking the June LSAT, you should register early to get your preferred testing site. Some testing sites fill up quickly, so you should register early! Thank you to the students that joined us for the LSAT Prep Fair last week! Applications for Chicago-Kent’s Honors Scholars program are due TODAY Feb. 12 for current applicants. Honors Scholars receive full tuition scholarships for 3 years. Candidates must have a GPA of at least 3.5 and LSAT score of 160. Visit their website for more details and to apply. Looking for some tips on how to make the most of a career fair? The Career Center is offering a workshop on Career Fair Prep TODAY, February 5, 5pm, Career Center Conference Room 143 at the Career Center. The Career Center is also offering workshops on crafting a strong resume, how to use LinkedIn, and more. Visit their website here for information on other great programming opportunities at the Career Center! Indiana University Maurer School of Law (Bloomington) is hosting a Diversity Law Day on Saturday, Feb. 17. This free event includes a mock class, lunch, tours of the law school, and sessions about critical thinking and what lawyers do. Visit their website here for more details and to register. Free Speech After Charlottesville–February 16 from 12-1 pm at the University of Illinois College of Law Rowe Auditorium. Speaker Teresa Sullivan will discuss the August 2017 events that involved clashes between white supremacists and counter-protestors on the grounds of UVA and in Charlottesville. She will discuss how these events have shaped the debate about free speech, led to discussions about the proper dividing line between free speech and hate speech, and changed the way that universities prepare for public assemblies that can lead to violent clashes between opposing groups. Free and open to the public–lunch will be provided to the first 200 participants. Find more details here. get discounts, win a scholarship or other raffle prize! For the LSAT Prep Fair workshop schedule and other details visit our website here! Applications for Chicago-Kent’s Honors Scholars program are due Feb. 12 for current applicants. Honors Scholars receive full tuition scholarships for 3 years. Candidates must have a GPA of at least 3.5 and LSAT score of 160. Visit their website for more details and to apply. 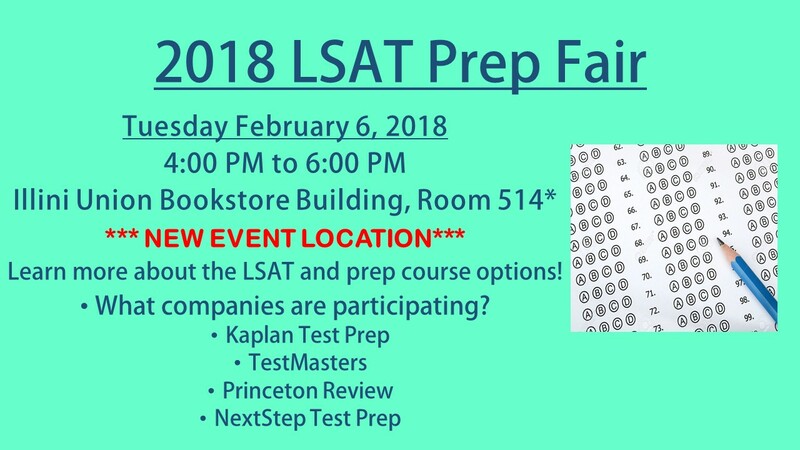 There has been a location change for our 2018 LSAT Prep Fair. 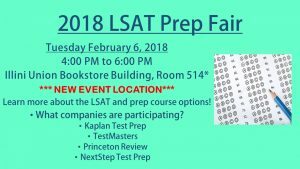 The LSAT Prep Fair is next Tuesday February 6 from 4PM to 6PM. The event will now take place at the Illini Union Bookstore Building, Room 514 (the 5th floor of the Illini Union Bookstore Building)! The elevator banks that lead to the 5th Floor are on the Wright Street Side of the building (not the bookstore entrance, just down the block a few steps).